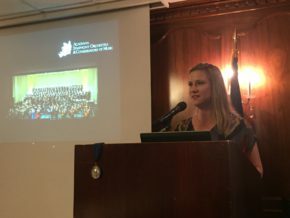 Kiwanis of Lafayette thanks Rebecca Doucet, Executive Director of the Acadiana Symphony Orchestra and Converatory of Music, for speaking to us today. Rebecca spoke to us about the Conservatory which is only one of three of its kind in the country. The Conservatory allows the professional musicians to teach music to school aged students. She also talked about some the other community outreach programs such as the Do Re Me program designed to improve learning for preschoolers through music. Lastly, Rebecca spoke about the Symphony's upcoming performance schedule as it embarks on a multi-year project focusing on Science, Technology, Engineering, the Arts, and Math. For more information about the current season, please visit their website here. Thanks again to Rebecca Doucet for speaking to us today.